Is the asteroid belt an exploded planet? There has been a theory proposed a while back that hypothesized an asteroid belt to be the remains of an exploded planet. I've heard several creation scientists holding to that theory as well. Why? Because it would not be contradictory to looking at our Solar System from an intelligent design perspective. The planets in the Solar System happen to lie at distances from each other that follow a pattern. That pattern is the same pattern created by the distances between the frequencies of music notes. The asteroid belt happens to lie at a distance where another planet fitting that pattern would be. Also, the way the asteroid belt orbits the Sun, makes you naturally ask, could that have been a planet before? The theory is largely abandoned now. One argument against the theory is that if you put together all the objects in the asteroid belt, it would make a rather small planet. It would be about half the size of our Moon. But then there's the fact that there are small objects similar to asteroids between other planets as well. 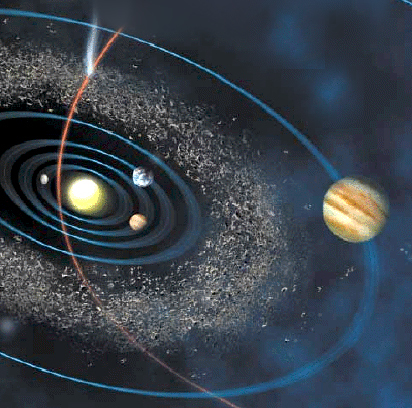 An asteroid belt lies between Mars and Jupiter. Between all the planets from Jupiter to Neptune are tens of thousands of centaurs. Beyond Neptune is a Kuiper Belt. Beyond the Kuiper Belt is the Scattered Disc. Closer to home, there are near-earth asteroids. So here's another hypothesis. All those belts are called differently, but they really are all pretty much the same objects, icy rocks. What if the remains of that planet dispersed beyond the asteroid belt, throughout the Solar System? What do you think? Is the asteroid belt an exploded planet?